From the first meeting to the completion of the job, your Acton home is treated as if it were our own. Your property is left clean of roofing debris. We do not use ugly roll-off disposal containers that block your driveway. Our own dump trailer leaves each day with the work crew, taking all rubbish and recyclable materials with it. We do not use roofing sub-contractors in Acton. Owner Anthony Van Kooten is on site every day to ensure work is done correctly. 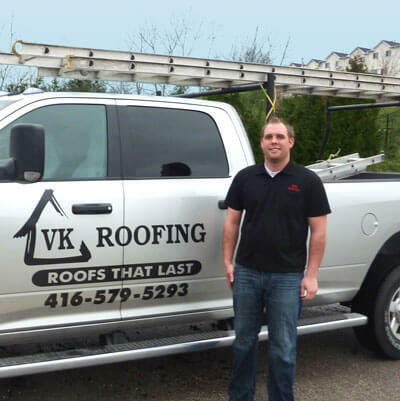 VK Roofing has built a solid reputation for excellent work on roofs in Acton, Georgetown, Milton, Brampton, Caledon, Bolton and Mississauga. Contact owner Anthony Van Kooten for a FREE No obligation quote for Acton roofing. After you have reviewed your written quotation package, we will finalize the cost, schedule and material selection.